For Mother’s Day, we went to my favorite chicken and waffles place – not Roscoe’s, not Honey Kettle, but Phorage, a Vietnamese restaurant. Tucked in a mini mall on Overland in the former Chego space, Phorage cooks up a great fried chicken and waffle plate (which includes a hash brown as well). The restaurant space is very clean and contemporary. You order at the counter, get a number and then choose a seat. There are just a handful of tables, a communal long table and a bar (eating space, not a bar that serves alcohol) along the wall. I love the chicken and waffles here. Boneless jidori chicken is lightly spiced and fried and super juicy. They use coconut milk in the waffles which gives them a nice flavor, and a bit of condensed milk is drizzled on top of the maple syrup. There’s even a small side of coleslaw and ketchup (which has a splash of hot sauce in it). We came here for Mother’s Day a year ago, and my daughter wound up eating my meal. Lesson learned. This time we both got the chicken and waffles. Once again, I have cleaned my plate. 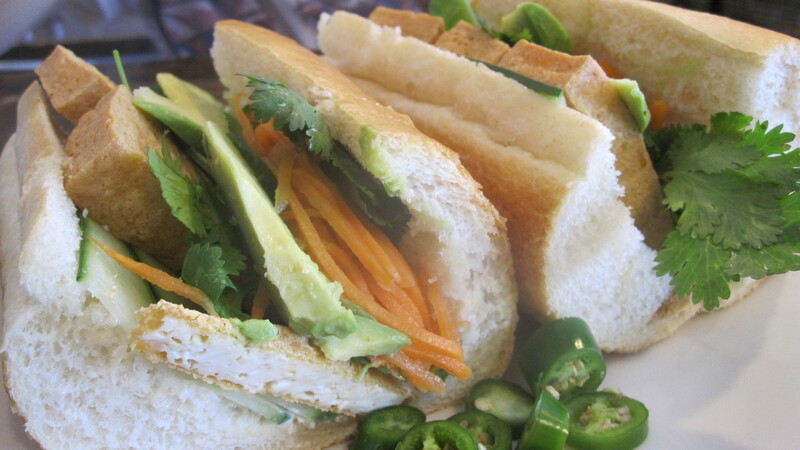 My husband opted for the vegetarian banh mi with tofu. It also came with avocado and was nice and light. Oddly enough, I have never had pho here. I have had the pork chop with broken rice and the pork chop with the vermicelli rice noodles. Both plates come with a fried spring roll (yum). The pork is tasty (I always wish there were more of it). The vermicelli is a bit plain, but there are bottles of strata and hoisin sauce on the tables to help add flavor. If you want fried chicken though, it’s only offered for brunch on the weekends. It’s the only brunch item they have in addition to their normal menu, but when something tastes as good as this plate does, you don’t need anything else!